TAIPEI, TAIWAN, April 9th, 2019 – Avalue Technology Inc. (TAIEX: 3479-TW), global embedded solution provider, associate member of Intel® Internet of Things Solutions Alliance. The world’s largest trade fair for embedded technologies “Embedded World” was held at the Nuremberg Exhibition Centre in Germany from February 26 to 28 this year. As a participant of the annual event, Avalue interacted with system integrators and dealers/ distributors, and showcased its latest embedded products and IoT related solutions. Many customers provided positive feedback and suggestions, and expressed their wishes to build closer partnerships with Avalue in the future. During its run, Embedded World 2019 echoed the most buzzed-about topics, such as “embedded intelligence”, “environment autonomously”, “security for embedded devices” and “microLED”, at its exhibition area and forum. From the concept of using cloud computing for embedded hardware, the trend has evolved to include embedded intelligence. When autonomous deep learning is introduced into embedded devices, information systems will be able to learn autonomously, make decisions autonomously and integrate into every area of our lives. In terms of hardware, there was much buzz about microLEDs and the latest HDR technology was also in the spotlight. The issue of security in embedded devices has always been an ongoing effort and many new-generation solutions were proposed during the trade fair. This year’s Embedded World saw an increase of 56% in the number of exhibitors and the second highest total number of visitors since it first started. Correspondingly, Avalue performed brilliantly during the trade fair with 10% increase in business opportunities in comparison to the previous year. Avalue products attracted customers mainly because they meet market trend. In addition to a series of complete embedded systems and cards enabling core application of embedded intelligence in IoT by system integrators, tablets are also customizable to adapt to harsh environments, e.g. high brightness for outdoor use, AR/AG/AF coating, wide temperature range, multi-OS, dual touch display, etc. To meet the need for security in embedded devices, Avalue introduced Renity Sentinal software. It enables real-time monitoring of any system or equipment, actively reports back on any maintenance requirement, and provides system analysis dashboard for administrators to keep track of system/equipment status, efficiently improving security control. Furthermore, with the industrial and healthcare markets being the two largest markets in the future, Avalue had especially introduced embedded intelligence-based smart healthcare solutions, including bedside terminal, room status display, e-ink series bedside card and pick-to-light system, which will improve hospitals’ service quality and efficiency, and quality of patient care. 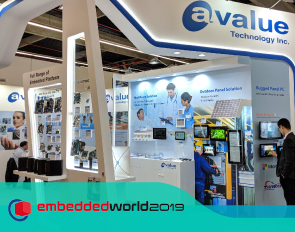 In addition to those showcased at Embedded World, Avalue has continuously rolled out different solutions to meet trends in the embedded market. For instance, its cloud-based smart industrial monitoring/diagnostic system enables AI machine learning in a smart environment, helping to find potential risks to industrial equipment through autonomous learning and protecting systems actively rather than passively. For the retail industry, there are also facial-recognition digital display board and smart showcase using embedded intelligence to help customers boost advertising effect. Looking forward, Avalue will continue to provide more customer value-driven solutions. For more information, please visit www.avalue.com.tw or www.avalue-solutions.com.